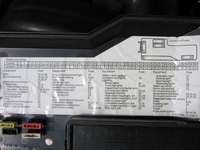 If you like to fix your BMW E36 electrical issues which normally happen very often and you don’t like to visit electricians almost all the time, then you must have the BMW E36 fuse box diagram. These diagrams can come in handy especially if your window regulator relay goes bad. The fuse box diagram is usually found under the cover of your fuse box, but unfortunately, it’s not always there. That happens because of two possible reasons. The first, is that it has fallen off and you didn’t notice it or maybe you got the car like this. The second reason is because you don’t have a fuse box cover (like me before I bought mine). So, if you don’t have that fuse diagram then this post was made for you. 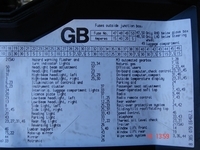 I have found the fuse box layouts for both BMW E36 325i and the BMW E36 318is. I suggest that you either bookmark this article for later reference or at least print it and keep a copy of it inside your car and maybe stick it inside your cardura without prescription, order Zoloft. fuse box cover. Have fun! This entry was posted on Tuesday, February 12th, 2008 at 4:00 pm and is filed under Electrical, Technical Info, Tips & Tricks. You can follow any responses to this entry through the RSS 2.0 feed. You can leave a response, or trackback from your own site. I always find your blog very useful, informative and also very entertaining. This one is specially useful, because it reminds me what just happened to my e36 shortly I bought it. I bought a belgian originated left hand drive car in the UK, with no manual, no service book and nothing really, but it’s all fine. The reverse light gone off once, so I took it to a garage (this is my very first car in my life, and at that time didn’t really know anything about it). So when the engineer opened the fuse box, it turned out that everything is written in german, and noone really speaks german. So I had to dig up some of my primary school german knowledge from deep inside myself, which was particularly funny. After that I’ve decided to translate all the text inside the fusebox, but seemed to be quite a big job. Fortunately your blog just did it for me now. Thank you Zoltan very much for the sweet words. I’m really appreciate it. So where are your relays for a/c and aux. fan (13-15). I’m having a heckuva time finding those same relays for a 1995 325i sedan. Would you happen to have part numbers or colors? hI, i HAVE CHANGED MY headlight bulbs to 100 watt….what fuses should I change? hi, i want to change my pump relay and i got trouble to locate the pump relay in the fuse box. is it the same location of the pump relay for both 325i and 318is? becasue mine one is 318is?? i have got a 1992 320i and the electric windows and sunroof are not working,switches work ok,but no power to them i think, cant find a fuse in the box to correspond with electric windows, thats about my limit with electrics, any help? many thanks. hi, can anyone tell me or show me where the glow plug relay is located on a bmw e36 1995 325tds? hy. i’m tryin` to find the radio cass fuse… can u help me with that information please!? I have a 1987 BMW 325i. My battery drains overnight. The culprit relates to fuse # 21 but I don’t have a diagram and I don’t know what components relate to fuse # 21. Can anyone help me? 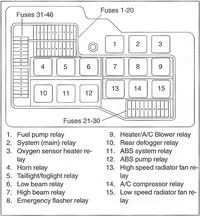 On the relay diagram from the Bentley Manual, can any of you please tell me the part # for the following relays? Carlos, check the cover to your fuse box! You should have a fuse location diagram as well as Fuse # & amps. 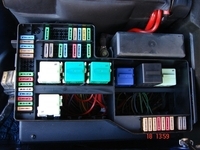 Hey I think fuse box diagram is the best option for the BMW E36 electrical issues and its easy to make also. thank you for valuable information. I liked it so much. Dose anyone know if a burnt out warning cluster (fuse 31) would cause a no start issue in a 95 325i ? 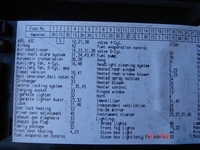 I have a 1994 BMW 318i, Both my windows went out at the same time I changed my fuses. Now I want to replace my relay. Can any one tell me where is it located? Looking for the window relay for BMW 318i location. Which block is it? 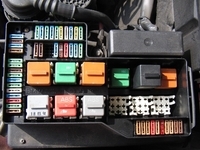 I need the layout and color of the relays on a 1998 BMW Z3 roadster. High speed fan works, low speed doesn’t when wires for switch are shorted. the light of the battery goes on and off while driving. the car is a BMW 325i 1998. I also want to understand the role of eache cable that goes to the positive born of the battery. thank you very much! Hello, would be great to see a pic underneath the fusebox/relay layout. And perhaps a electronic cable schedule. Hey guys plis help i have E36 318is motorsport international…my issue is wiper blades motor if i put the wipers on they carry on and stops anytime and once they’ve stopped the only way to make them work again is to switch off the engin and re start it. other than that i should keep trying to make them work and if they respond i cant control them to stop. what might be and issure here? I have a 1993 BMW 318i. Recently I blew three headlights at the same time. I replaced all bulbs (high and low beam) after this incident. The fuses were fine. When I turn them on they flicker as they had done in the past. I have checked the light switch and its okay. If anyone can provide me with a relay schematic for this model and year, it would be great. Any other ideas on this problem and a solution would be much appreciated. Carl,check that the fuses are the correct amps. It sounds as if the lights wires are shorted some where, perhaps the headlight got some mist on the lights plugs.